Today has been a busy one and I’m happily ensconced in my lovely little apartment after walking all over the place today! My feet are tired and my knees are arguing over which one aches the worst but the rest of me is very content. I spent an hour or so first thing this morning at the daily market at the Campo dei Fiori, bought veggies and some sliced meats to go with my wine and of course a couple of wine glasses – to go with the wine. I suspect that will be a regular habit, both the shopping and the wine. 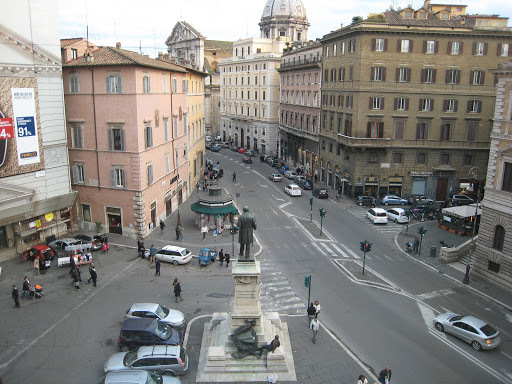 I then headed off towards the Spanish Steps to get organized with the school where I’ll be spending a good part of every day for the next two months and wandered around with a guide from the school. A little obtuse as I don’t – yet – speak Italian but I determined to take the same tour in a months time to see how much I will have learned! Everything here is on sale – shoppers haven but so far I have resisted – big deal you say – only been here one day! Frette is calling so sweetly! I have a lovely artichoke and a glass or two of wine calling me – I had planned on eating out but I think an early night is the ticket. No I’m NOT getting stodgy just catching up from jet lag!